A soothing sunset over the coastal waters of Fleur de Lys, Newfoundland from the lookout point where a pair of sunglasses sit which belong to a tourist who is taking in the scenery. 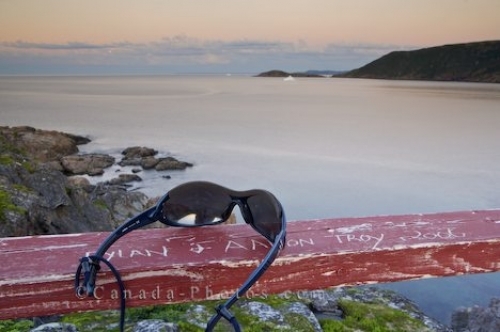 A pair of sunglasses resting on a railing along the Ocean View Trail in the town of Fleur de Lys in Newfoundland where tourists stop to enjoy the beautiful coastal scenery. A prime time of day is at sunset as the colors can highlight the sky while icebergs float by in the distance. Glasses on the railing at the viewpoint of the Ocean View Trail with an iceberg and coastal scenery during sunset in the town of Fleur de Lys, Dorset Trail, Highway 410, Baie Verte Peninsula, Newfoundland, Newfoundland Labrador, Canada. Picture of a pair of sunglasses on the railing overlooking the coastal scenery from the town of Fleur de Lys in Newfoundland.